We’ve been meaning to stay here only for a week, BUT… We have a valid excuse for still being here. We’ve been waiting for a package to arrive for over a month, spare parts for our generator. Never, ever will we do this again. It would have been much more practical and economical to just fly to San Diego and pick up the blasted thing … Anyway, money fixes everything, so after forking out what seems to us “extortion money”, it looks like the stuff is on its way and we should receive it middle of next week. After that we’ll be free to leave. Today Tom and I went to Paradise Village -close to Puerto Vallarta- to talk to Vilma, the lady who is dealing with the infamous Mexican Customs and fighting to get our stuff delivered. 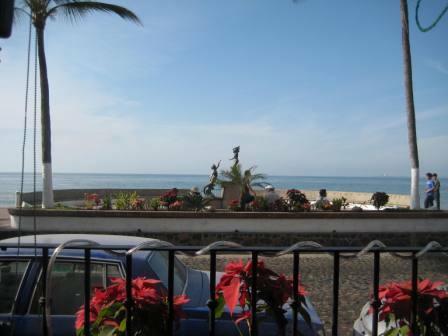 To soften the blow of having to pay the ransom, we played tourists for a while and grabbed the bus from Paradise to Puerto Vallarta. It was fun enough, but we were happy to come back to the quiet of La Cruz. We were exhausted from 6 hours of walking in the sun, dodging the time-share vendors (they’re everywhere!) 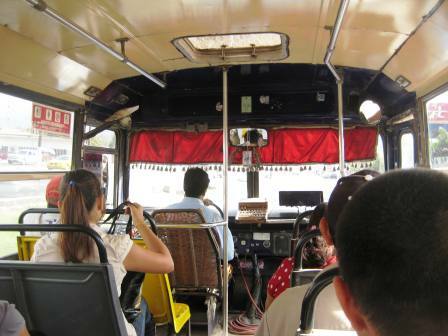 and surviving the bumpiest bus ride we ever had. From the bus stop it’s about a half mile to the Marina. So we muster the last of our energy to walk home and Tom is whining a bit about how tired he is, when we hear his name being called from inside one of the restaurants along the way. Yes, the waiters are on first-name basis with Tom. Don’t ask… Here comes Vicente, the head waiter from Frascati Italian Restaurant, hollering “Toooom, mi amiiiigo! Como estas?! Do you like watermelon?” Huh??? What’s he talking about? Seeing our dumb expression, Vicente drags us to his beat-up car, opens the door and produces this massive watermelon. “I kept this for you, it’s from my brother’s farm” he says with a big, proud smile on his face. And promptly plops this 20 pounder in Tom’s arms. Oh, the look on Tom’s face! 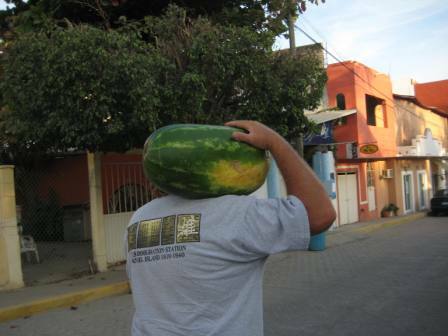 Gratitude and concern… After profusely thanking Vicente, Tom lugs the toddler-sized melon on his shoulder and shuffles down the street, me in tow laughing my head off… What are we going to do with this huge thing? Share it with our friends and neighbors very soon, of course! Later, after a rejuvenating shower and some rest, we meet with friends Susan and Keith at the local German Restaurant Black Forest. I know, what is a German restaurant doing in La Cruz??? Anyway, Tom was craving German food from his days in The Army when he was stationed in Germany for 3 years. He got his fill of Schnitzel, Strudel and so much more! So did I, for that matter… Surprisingly excellent food, but the surprises didn’t end there. We were treated to live music by the German Gypsies Latcho and Andrea playing excellent flamenco music and classic guitar melodies, singing in Spanish like they were born here. Music so full of passion, even the Mexican lady celebrating her 97th birthday at the table next to ours got up and danced with an 89 year old suitor. Her 50-something granddaughter soon followed twirling her magnificent red dress, and soon half of the family was dancing various flamenco styles on the 5 feet square dance floor. The show was on… The love for music, the passion for rhythm these people have, it’s just amazing.